"Photo Slideshow Maker is the best Program to create easy flash files from images. 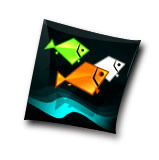 Many features are not found in any other flash designer or creator software... the option to create a single flash file does the job very well and better as most competitors. It's an excellent program." Go2Album (www.go2album.com) is a free online photo gallery dedicated to Photo Slideshow Maker users. Photo Slideshow Maker helps you create gorgeous photo flash slideshows with music and transition effects, and lots of beautifully-designed flash templates. You can publish the photo slideshows to our free photo album hosting service Go2Album to share with friends. What's more, your can then add the slideshow to MySpace, Blogger, Live Space, Yahoo 360, WordPress, LiveJournal, and all social websites and blogs that support editing HTML code. To create photo slideshows that can be uploaded to Go2Album, you need to download and install Photo Slideshow Maker. You can use Photo Slideshow Maker to directly upload photo album to this free web album hosting. Just one click to upload, saving lots of time. By doing so, you can also spare lots of space for your website server. 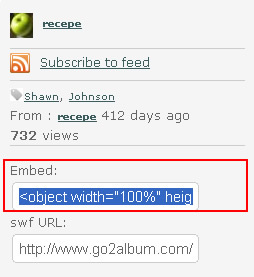 Go2album provides you with three embedding methods: embed tag, swf url and html url. After uploading, you just need to copy and paste the code to your web page to embed without worrying the file path. You can directly change the embed code on your website when you want to update photo album and don't have to handle the flash file. Using Go2album embed code, you can embed your photo album to any website/blog that supports editing HTML code. Supported website includes: MySpace, Live Space, Blogger, WordPress, Friendster, Orkut, AIM, AOL Journal, eBay, Hi5, Xanga, Piczo, Tagged, Yahoo Geocities, LiveJournal, TypePad, etc. Fullfill your personal and commercial needs. If you want to upload photo slideshow for sharing, you can send an album link to your friends and family via email or instant messenger so that they can share your gorgeous album in no time. People can also comment your photo album on Go2album by login. Big and small business can even utilize Photo Slideshow Maker and Go2Album to better showcase products in eBay, by demonstrating item descriptions with eye-catching flash slideshows. HTML code supported website or blog MySpace, Live Space, Blogger, WordPress, Friendster, Orkut, AIM, AOL Journal, eBay, Hi5, Xanga, Piczo, Tagged, Yahoo Geocities, LiveJournal, TypePad, etc. If you don't want to upload slideshow files to Web server, or have difficulty in handling the file path, you can simply upload the Flash slideshow to our free web album service Go2Album, and then get the HTML code to embed to your webpage.